Many Malaysians have reached home earlier today, usual Friday afternoon is always filled with traffic congestion especially in late evening. 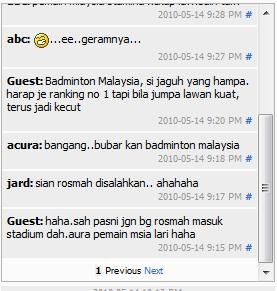 Today is somehow different…the roads are not very congested, as people have reached their home, wait to watch the live telecast of semifinal between Malaysia and China in Thomas Cup 2010 held at Stadium Putra, Bukit Jalil. The results are pretty much expected. We knew that we have the slightest chance to beat China because China is very strong in badminton. The country has a lot of skillful players like Lin Dan which is regarded as world best badminton player eventhough Lee Chong Wei from Malaysia is current world number one player. Their performances can be compared easily, and Lin Dan definitely outshine Chong Wei. World number one men's singles, Datuk Lee Chong Wei playing against Beijing Olympic gold medallist and three-time world champion, Lin Dan, lost 17-21, 8-21 in 47 minutes. In the first set, Chong Wei was trailing the Chinese ace 3-10, 9-16, 17-20 before a drop-shot by Lin Dan gave him the match point 21-17. While Lin Dan was playing his normal game, the Malaysian looked tense and failed to match his opponent at the net and kept sending the shuttle off the baseline. Trailing behind 2-6, 6-14, 7-20 in the second set, Lin Dan gave a chance for Chong Wei to add a point before sealing the match 21-8, through a drop shot. Chong Wei said his earlier plan failed to materialise and he was uncertain in the first set. "Everything did not work as planned. When Lin Dan was leading 9-16 in the first set, I was lost for direction, as though the court had become smaller and did not know where to send the shuttle. "Lin Dan was also playing an aggressive game. Maybe I was too eager to win, but that is not the reason for my defeat," he told reporters Friday. Meanwhile, Lin Dan said both of them were playing under pressure as both teams wanted them to deliver the first point, to open the final path for their respective teams. "I could feel Chong Wei was tense. Maybe, after 18 years since Malaysia last won the Cup, Chong Wei was feeling the burden of bringing the coveted Cup home. "And I'm happy to beat the Malaysian in his home ground," said Lin Dan, who is one rung below the Malaysian in the world ranking. However, it is still a good news that Malaysia went to the top four spot of the championship, the others being China, Indonesia and unexpectedly Japan, which had improved a lot in badminton. We all would thought of South Korea but they are defeated by China, the mighty giant. Holding the cup for few years continuously, China is probably going to retain the cup again this year, by winning Malaysia just now in semifinal and will be getting easier with Indonesia in final. Malaysia lost tragically to China, 3-0, without even winning a single set of the games. How disappointing and embarassing! With so many local supports and cheers, Malaysians were unable to do at their best just now! They seems too nervous in their homeground, and the China team is proven to be much better! Go more training before coming back to court, Malaysian players! Got effort, but with no performance…hence no use also…what a terrifying result! Some people says, it's causing by Rosmah the first lady of Malaysia. She came during Japan and China matches but not during Denmark (that's why Malaysia won during that time)... hmm.. i don't know lah. 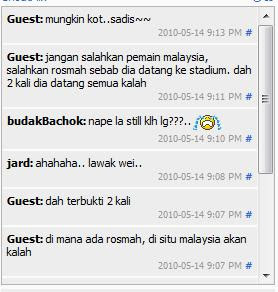 start by Guest - "di mana ada rosmah, di situ malaysia akan kalah"
"Jangan salahkan pemain malaysia, salahkan rosmah sebab dia datang ke stadium, dah 2 kali dia datang semua kalah"
Meaning: "When Rosmah came, Malaysia will lose"
"Do not blame Malaysian player, blame her for coming into the stadium, twice she comes, all lose"
The other two matches are not played since China had won the competition. Whatever it is, I will be going to watch the final show of the Thomas Cup too, as well as Uber Cup which is for women category. It is going to be exciting matches eventhough without Malaysia. Hopefully Indonesia can beat China during the final. And for Malaysia, we may try again next time.